Auto record Skype calls / interviews... in high quality audio and video formats! Auto upload recordings to server... with SFTP connections! Perform Skype parental control... in Hidden Mode! Trusted by Over 500,000 Skype users! an impressive call recorder Skype, we highly recommend! What can Call Recorder for Skype do? 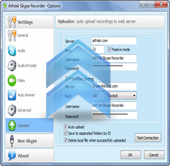 AthTek Call Recorder for Skype enables users to record Skype calls in high-quality video format. It will record whatever you see in the video call over Skype. It supports to change the video encoder for better video recording performance. 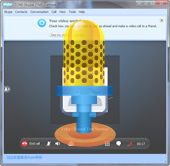 Call Recorder for Skype gives you the ability to record interviews over Skype. 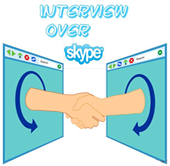 No matter you are an HR supervisor or a interviewee, AthTek Call Recorder for Skype will definitely help with the interview over Skype and a good result. One unique feature of AthTek Call Recorder is hidden mode. The program will run invisibly on the computer and perform a strict parental control over Skype for the program owner. This is somehow overkill. Please DO NOT use it in any illegal activity. Whenever you don't want to pick up the Skype call for reasons, Call Recorder for Skype can answer the call like a robot for you. It can even divide your contacts into several group and left an customized automatic answer to these groups each. 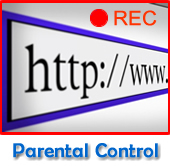 You are able to upload the recordings to a web server safely and automatically. If you have an FTP account, you can enter the FTP address, username and password to Call Recorder for Skype. Then the recordings will be uploaded automatically. Google "Skype Class" you will find many lessons are provided over Skype for free. You can register any of the lessons to learn. If you don't have a photographic memory, you should record your lessons with AthTek Call Reorder for Skype. 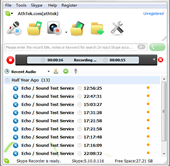 Plus much more... Free download Call Recorder for Skype now to experience it!